Just four stocks have accounted for 84 percent of the S&P’s upside in 2018. Defensive sectors account for a historically small part of the S&P’s current market cap. The large gap between growth and value stocks is not sustainable long-term. 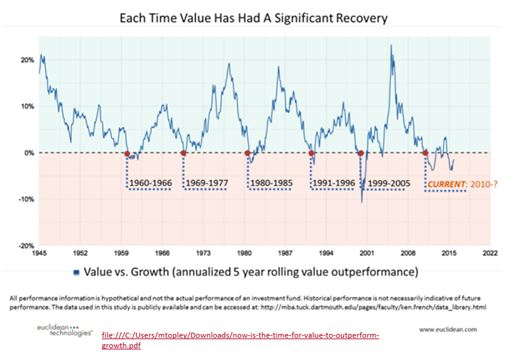 Growth stocks have outperformed value stocks for extended periods six times since 1945….each time, that run was followed by a significant recovery in value stocks. Even if the yield curve inverts, there should be plenty of opportunities for savvy investors. The first chart to start this quarter’s letter looks more like a stairway to hell. It depicts the composition of traditionally defensive sectors (utilities, telecom, pharma, consumer staples) as a percentage of the S&P 500 index. Representing a record-low 11 percent of the index’s total market cap today, defensive sectors have sunk below levels last seen during the internet bubble era of early 2000. In my early adulthood, it was a safe bet that you were staying out too late when the rock classic “Stairway to Heaven” came on the bar’s sound system at closing time. But, as an almost-50 year old reading Led Zeppelin’s iconic lyrics today, I can see why “Stairway to Heaven” is a perennial fixture on classic rock Top-10 lists. Throughout my Firm Letters over the past three years, I have defended the bullish case against Trump election doomsayers, mini-bubble procrastinators and comparisons to the 1999 tech crash. However the conclusion of my Q4 Letter of 2017 (It Ain’t Over, but the Fat Lady is Warming Up) hinted that the bull market was entering its “euphoria stage.” And now in the second half of 2018, it’s clear we are seeing a historically large spread between growth stocks and value stocks. Equity markets: The relative weight of defensive stocks (such as utilities) in the S&P 500 continues to trend lower. As you can see in the chart below, there has been a clear break through the Internet Bubble lows of 2000. 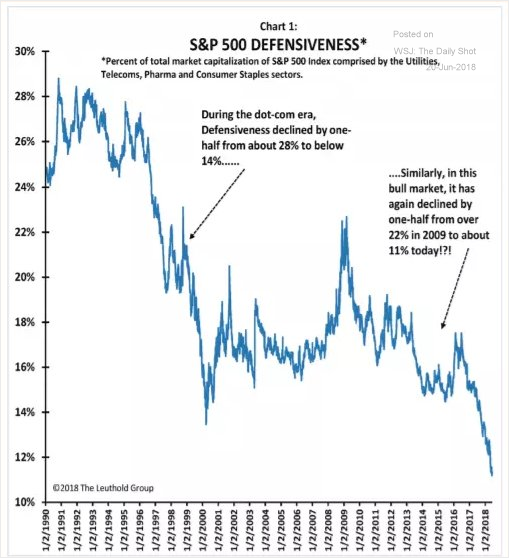 The last time we saw such a giant gap between defensive sectors and the rest of the market, that spread was erased quickly during the unraveling of internet stocks at the beginning of this century. Unlike the dot-com era, we do not have a rampant IPO market of zero-revenue “story stocks” today, but we do have massive gaps such as FAANG stocks (Facebook, Amazon, Apple, Netflix and Google) outperforming traditional value sectors by over 700 percent during the last five years. As some of you may know, I started my trading life in 1997 at an earnings momentum shop that focused on tech stocks. My introduction to Wall Street was trading tech stocks and other high growth sectors during the internet bubble. As mentioned in my past letters, we are not experiencing anything like the internet bubble today. If anything, that risk is found in the venture capital and private equity world today, not in the hands of public market investors. However, we are experiencing a historically large spread between value stocks and growth stocks that will eventually revert to the mean. 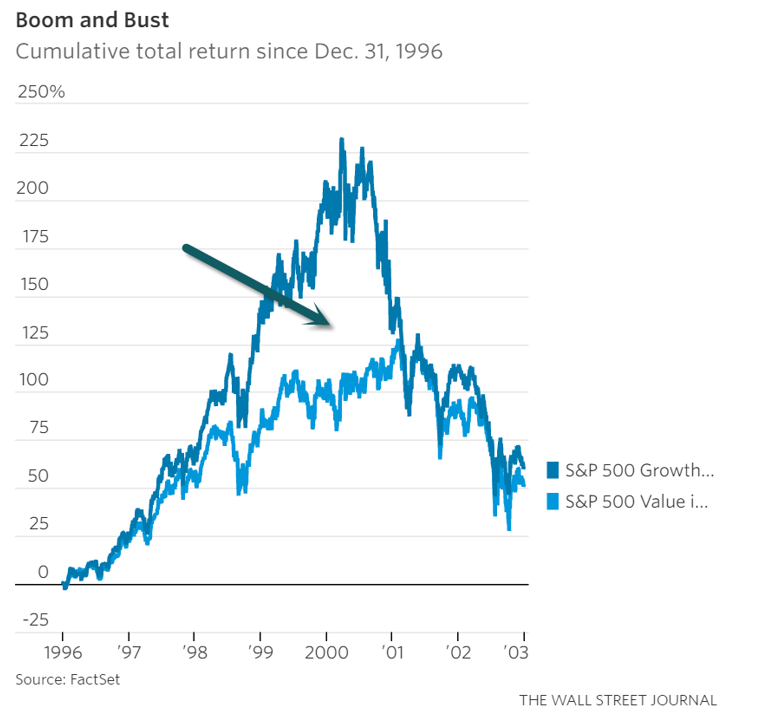 When gaps between growth and value form like they did during the dot-com boom (see chart below), they are reflected in valuation spreads. Right now, U.S. growth stocks are trading at a 59-percent higher price-to-book ratio than U.S. value stocks are, and they’re trading at a 67-percent premium to U.S. small cap value names. The largest spread right now is an almost 80-percent price-to-book premium for U.S. growth stocks over emerging market value stocks. The majority of capital asset pricing models (CAPM), which are strictly math-based, predict that emerging markets will be the highest performing asset class for the next 10 years–if you can stomach the volatility. Emerging market valuations are relatively cheap and middle class growth projections are positive, but debt levels in U.S. dollars are high, hence the recent 20-percent correction around a 7-percent rally in the U.S. dollar relative to other currencies. During my early trading days in the late 1990s, there was talk about a new world order in which value-oriented Benjamin Graham advocates were no longer relevant. Today there’s talk about a new world order in which technology-driven whiz kids will dominate the markets. Artificial intelligence, robotics, internet of things, intelligent agents and virtual reality are all part of the “fourth industrial revolution” that is changing the world. But, as often happens, there may be far more losers than winners in this race to the top. As the market continues to narrow and a small number of names drive all the alpha, you start to hear comments like these from new world order investors: Value investing is a lost cause. That’s not surprising when just four high-flying tech stocks–AMZN, MSFT, NFLX and AAPL–have been responsible for 84 percent of the S&P’s entire upside for the year-to-date. But, as Barron’s predicted in March, the big valuation gap between growth and value funds indicates a value comeback. Those conflicting viewpoints have led to a stark contrast between the valuation of Baron Opportunity’s and Heartland Value’s portfolios—and their respective performance. According to Morningstar Direct, Baron Opportunity’s stocks have an average trailing 12-month price/earnings ratio of 42, compared to Heartland Value’s 7. Baron Opportunity’s five-year annualized return of 14.2 percent is double Heartland’s 7.1 percent. Small wonder, as market darlings like Amazon, Alphabet (GOOG), and Tesla (TSLA) dominate Lippert’s portfolio. Headlines like these remind me of late 1999 when Barron’s asked: “What’s Wrong, Warren?” The article suggested that legendary value investor, Warren Buffett, was losing his magic touch. During the 20-month period ending in February of 2000, the Nasdaq was up 145 percent, while Buffet’s Berkshire fund was down 44 percent — a mind-bending 189 percent streak of underperformance for the Oracle of Omaha, at least compared to Nasdaq’s growth-oriented technology stocks. My good friends at Alpha Architects explained why. Growth stocks have outperformed value stocks for extended periods six times since 1945….and each time, that run was followed by a significant recovery in value stocks. Timing this rotation is impossible, but we are getting close to record spreads in valuations with interest rates rising and unemployment at record lows. Many believe that an inverted yield curve, in which short-term interest rates are higher than long-term rates, is a reliable indicator of a forthcoming recession. The difficulty with the inverted yield curve is that stocks tend to do really well when the curve flattens, as is the case today. Stocks also tend to do well shortly after the curve inverts. But, today the defensive sectors that are lagging now have huge outperformance in a down market. 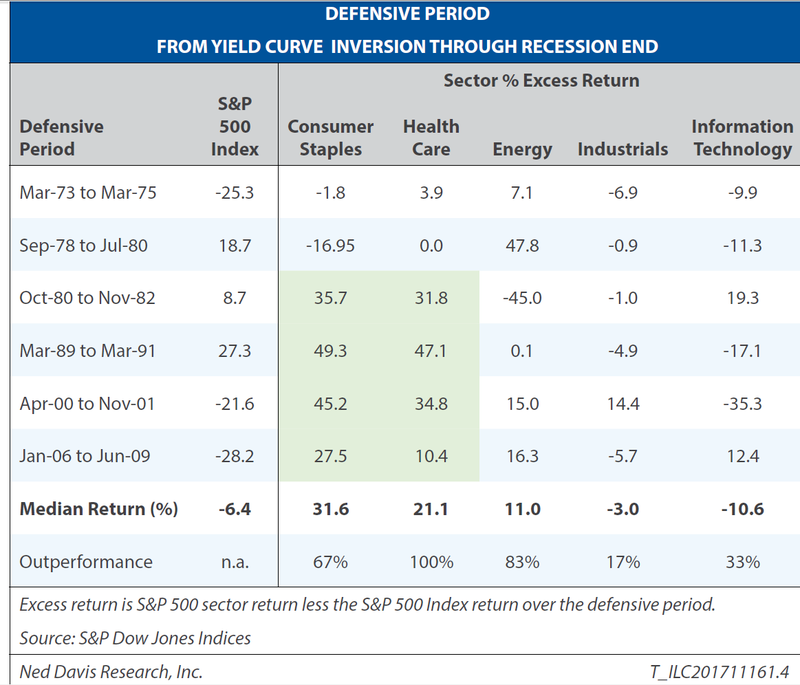 Chart shows sector performance when yield curve inverts (Fortis #1 recession signal). Even in recessions, the sector divergence is striking. The past 4 defensive periods show healthcare and consumer staples outperforming the S&P 500 Index by 40.5% and 33% respectively. The difficulty with reversion to the mean is that you can go broke waiting for market to express itself fundamentally back toward value. Right now, our five recession indicators are all green with none showing signs of an imminent implosion. What’s more, our technical momentum indicators all point to U.S. growth stocks maintaining leadership. At Fortis we believe in evidence-based academically-backed research. 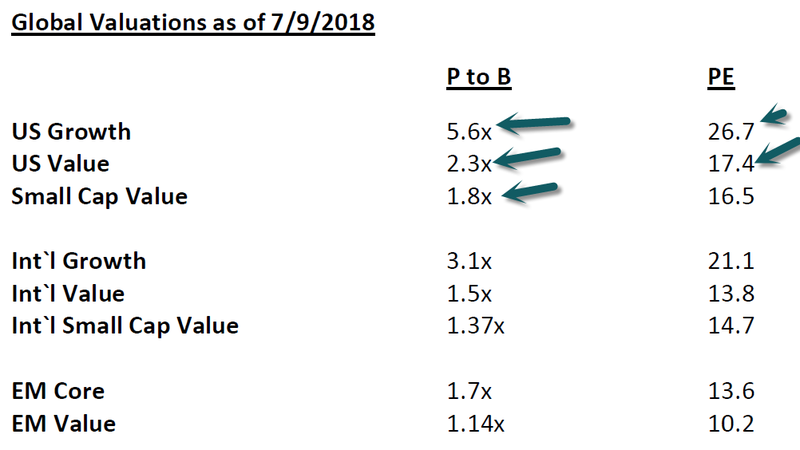 With this philosophy leading our investment thesis, we conquer the challenges discussed in this Letter by combining momentum stocks and value stocks. The reasons behind this strategy require a much longer discussion, but please feel free to contact me any time (610-233-1074) to discuss in more detail. In the end, there are “two paths you can go by” in market-growth or value. Right now we are experiencing historic spreads between the two. As has happened throughout history, the new pundits arrive singing the death of one path–in this case value–due to the permanent triumph of the other, in this case growth. Remember back in 1999 when the “talking heads” were predicting the end of Warren Buffet’s value strategy? Remember after the 2008 crash when the S&P hit a generational low 650 and the same talking heads were predicting the end of growth in America? The Stairway to Heaven for the last decade has been growth stocks, but every elevator has a top floor.